James Garfield was the 20th President of the United States. Garfield's presidency was a short one when a former political supporter shot him in the back just a few months after taking office. 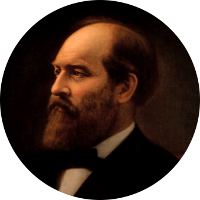 President Garfield survived for almost 3 months while doctors tried to remove the bullet. He died from an infection on 19 September 1881. James Garfield was born on 19 November 1831 in Cuyahoga County, Ohio to Abram and Eliza (Ballou) Garfield. James was a school teacher turned lawyer before being elected to the Ohio state senate. During the Civil War, he was commissioned a Lieutenant Colonel in the Union Army and reached the rank of Brigadier General after a successful campaign to rid eastern Kentucky of Confederate forces. President Garfield has a number of famous kin including friend and later political adversary Salmon P. Chase. He has connections to a number of U.S. presidents including Chester Arthur, William Howard Taft, Calvin Coolidge, Franklin D. Roosevelt, Gerald Ford, and both George Bushes. Some celebrity kin include Walt Disney, actress Raquel Welch, and actor Richard Gere. He is a descendant of the Mayflower's John Billington, and is a cousin to his wife Lucretia Rudolph.